Lab Created Diamonds: The Same Wow Factor As Natural Diamonds? 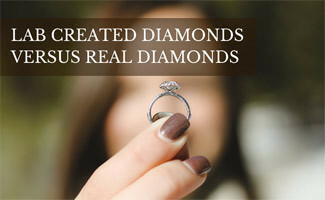 Home > Love > Engagement > Lab Created Diamonds Vs Real Diamonds: Do You Get The Same Wow Factor? You might scoff at the idea of man-made diamonds vs mined diamonds, but lab created diamonds are a booming industry these days for many reasons. Contrary to what you might think, lab diamonds are “real” diamonds, but what exactly are lab created diamonds? How do they differ from earth-mined diamonds? Are they a good alternative? How Are Diamonds Made In A Lab? Lab created diamonds, also known as manufactured or cultured diamonds, are grown in laboratories using advanced technology that duplicate how diamonds naturally develop in the Earth’s mantle. They exhibit the same optical, physical and chemical properties as earth-mined diamonds. Labs grow diamonds from tiny carbon atoms of pre-existing diamonds and arrange these carbon seeds in the characteristic diamond crystal structure. Then they use advanced technology that mimics the natural method under which diamonds form. To create lab-grown colored diamonds, lab technicians introduce small amounts of specific trace elements during the growth phase of the diamond (just as it occurs in nature). In both white and fancy colored lab diamonds, the exact composition of these trace elements can differ from natural diamonds. What’s the difference between lab created diamonds vs mined diamonds? Lab-grown diamonds are pure crystallized carbon diamonds and have the same chemical, physical, and optical properties as earth-mined diamonds. The only way to distinguish one from the other is by using highly specialized equipment that can detect the minor differences in crystal growth and trace elements. Moissanite can be confusing to the amateur because this gem is also lab created, but Moissanite is considered a diamond simulant. Moissanite and other diamond simulants like Cubic Zirconia (CZ) and White Topaz contain no diamond elements and are considered non-precious gems. Moissanite varies significantly from diamonds in both appearance and composition. There’s really no comparison. Moissannite consists of silicon carbide, rather than carbon, so it’s an entirely different gemstone. From a distance, Moissanite might appear somewhat similar to a diamond, but the two are noticeably distinct upon closer inspection — even to a non-expert’s eye. Moissannite isn’t nearly as clear and brilliant as a diamond. Although you can save 50-75% of what you’d pay for a diamond, you’re not getting a valuable, precious gemstone. Should I Buy A Lab Made Diamond? One of the first questions people ask: are lab created diamonds worth anything? Yes; lab diamonds are an excellent value, particularly if you’re on a tight budget. Manufactured diamonds are graded on the same scale as earth-mined diamonds, and the only difference is their point of origin. There are several benefits of lab-grown diamonds, but some people may find drawbacks. Consider these pros and cons. Mining destroys the Earth’s crust and mantle. It also takes considerably less energy to grow a diamond in a lab than it does to mine one out of the ground. Finally, there are limited resources in the earth, and this includes diamonds. Thus, this rare natural gem is likely to increase in price as supplies dwindle, making lab created diamonds a more sustainable choice. The issue of conflict or “blood” diamonds is a significant factor in many consumers’ minds. With a lab-grown diamond bought from a reputable source, you can be confident that your purchase isn’t supporting wars or child labor. Read our article on blood diamonds to learn more. You can save 10-30% or more with a manufactured diamond over a natural one. The savings can be even higher if you want a colored diamond — earth-mined colored diamonds are incredibly scarce and consequently very expensive. While lab diamonds support advanced economies, they also take jobs away from impoverished areas around the world that depend on the jobs and income from diamond mines. Every mined diamond is a unique creation of nature. Synthetic diamonds, however, are mass-produced in labs. Some people may find that the glamour, mystery and romance of the precious gemstone is lost with lab diamonds. Are Man Made Diamonds Controversial? See what some consumers, jewelers and industry experts have to say about manufactured diamonds in this brief video. Where Can I Find Lab Created Diamonds? Many jewelry stores carry manufactured diamonds these days, but you can also find lab created diamond engagement rings and other jewelry online. Be sure to check out our reviews of the best online engagement rings, which feature quality, highly-recommended and affordable online jewelry stores along with reviews of each. Also visit our guide to alternative engagement rings. What’s your opinion on lab diamonds vs mined diamonds?